Southern Italians have a strong connection with Africa. Physically it is so close. Many of us have African blood pulsing through our veins. My oldest sister has always had a strong affinity with African culture, especially it's dance. My sister (back to us) and the other dancers from Djoniba Dance and Drum Centre in Senegal. My sister had been a professional dancer and at one time she was involved with a group that taught African dance to the inner city kids of New Haven, Ct. 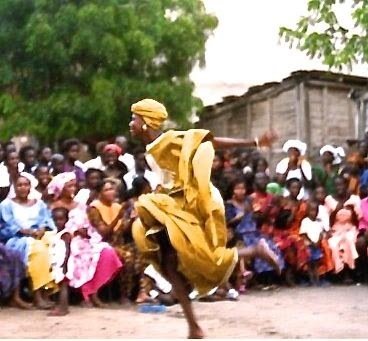 Her group also performed and traveled to Senegal to learn dances by visiting villages throughout the country. 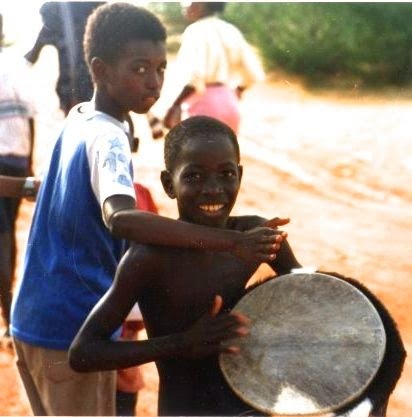 Children from a village in Senegal. 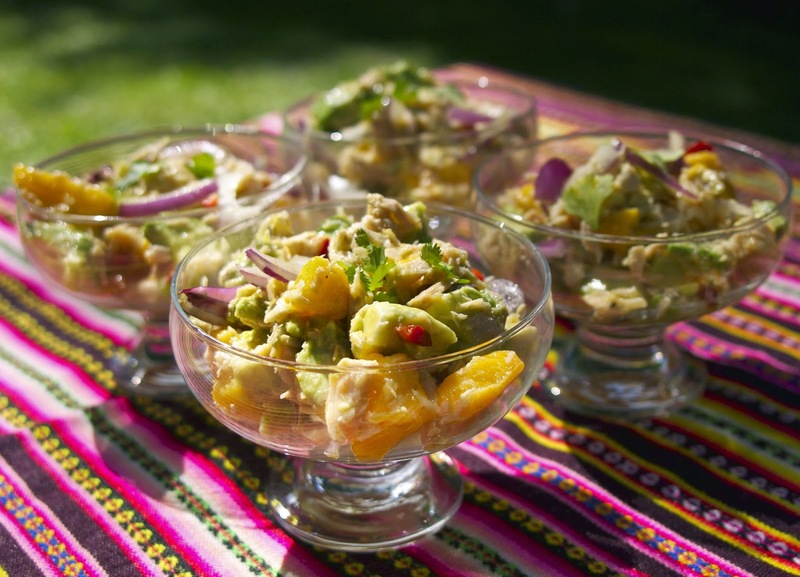 The original dish our French Fridays with Dorie group is making: Tuna and Mango Ceviche is inspired by France's colonial connection with the West African country of Senegal. when someone greets you in Senegal and asks, "How are you?" They really want to know. It isn't just a polite thing to say like it is for us. Dancer at a festival in Senegal. So I tried to take this to heart. I slowed down and enjoy this dish, while I tried to connect more with the people around me. I didn't make the original raw tuna version because I really wasn't up to tracking down sushi grade tuna. The salad I made was delicious. Light and colorful with a bundle of contrasting flavors. I don't regret not making the original recipe. Instead of driving around to stores, I spent the day relaxing with my family and enjoying one of the last beautiful days of Summer. My sister and a Senegalese dancer. I would say that was more in keeping with the Senegalese spirit...wouldn't you? 1) Whisk together in a small bowl: the juice and zest of one lime, ginger, EVOO, rum, cilantro, salt and some pepper. Put aside. 2) In a medium size bowl put the tuna that has been drained and flaked. Add the red onion and chile pepper. Mix. 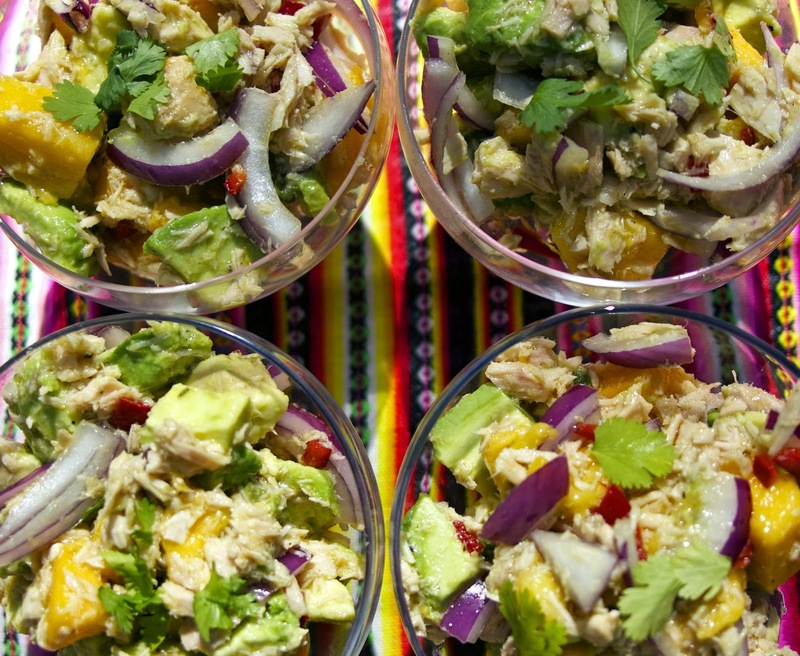 3) Add the mango and avocados to the tuna mixture. Spray the avocado with the juice of 1 lime. Gentle mix the mango and avocados into the tuna. 4) Once all the ingredients are tossed drizzle the vinaigrette over the salad and gentle mix again. 5) Garnish with more cilantro leaves. 6) Cut the remaining lime into wedges and have the Tabasco sauce available so everyone can adjust the salad to their personal tastes. Thanks so much... I love when food makes you think of faraway places. Mmm this looks fantastic. What a fresh and vibrant dish, Diane! a simple dish with some really fresh fruit. I'm going to try it with cooked shrimp too. What a wonderful Post. Your sister was as adventurous and quite the traveler, like you, is that right? I've never thought of the Italians having a western African connection but, of course. you're right. Thank you for the history lesson. And, I agree, your tuna salad concoction looks delicious. Love your version. We are an adventurous lot. When you have grandparents that got on boats to American when they were teenagers with just a name of a cousin.... I guess I'm not too surprised that we enjoy being in foreign lands. I was surprised I like the combination of flavors too. They do seem odd. Between my sister and I we have covered a lot of the globe. 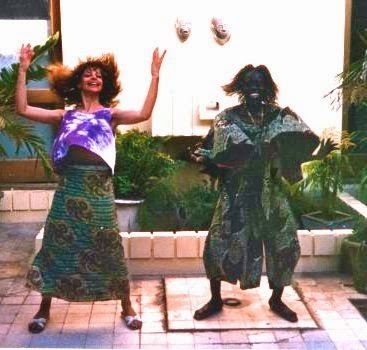 After the stories you told about your sister when we were in NYC, it's not surprising to see her dancing in Senegal. What a wonderful adventure. Your tuna salad looks tasty. You definitely made the right choice, to enjoy the beautiful weather with your family rather than driving around trying to find ingredients. It was one of my rare African moments. I enjoyed reading about your sister! A really fun post, Diane. I think you and your sister both look so much alike. She really is quite adventurous! Your tuna salad looks perfect, and since I don’t do raw fish, I’m also quite sure I would have really enjoyed your version! I went with Dories Bonn Idee and made the Seared Shrimp with mango and avocado! Loved it! Yes, my oldest sister and I do look a lot a like and different. She has darker hair and eyes and stronger features, but we have the same smile. I plan on making this with shrimp next time. I think all round it will taste terrific. Now, that is a great option, canned tuna! and after I went and got me frozen tuna just because I used up the shrimps (my 1st option!) for DH's dinner because I was busy with hospital visits and no shopping! Such a fun post and this looks like a recipe I would like to try! Glad I found this at Motivational Monday #109. Looks yummy! Pinning it. Your salad looks mouthwatering. The West African Tuna Salad will be a nice lunch around here soon. Thank you for sharing with the Clever Chicks Blog Hop! I hope you’ll join us again next week! Great post, Diane. Thanks so much for sharing the photos and experiences of your sister. Your salad sounds equally as delicious as the ceviche and I agree, why spend your Sunday chasing down an ingredient when you can enjoy it with family. We went the salad route as well - I think making do with what is readily available also fits in the spirit. Such a beautiful salad! Thank you so much for linking up at Tasty Tuesday! Your recipe has been pinned to the Tasty Tuesday Pinterest board! Please join us again this week! Very nice colorful tuna salad, thanks for sharing with Hearth and Soul blog hop. pinning. Your salad looks delicious. I enjoy reading about others' travels and your sister's time in Senegal looks amazing. Thanks for sharing both the recipe and story with us at Let's Get Real. I hope you'll join us again next Thursday. Beautiful post, Diane. The story, the pictures, the connection with food...loved it all. The salad looks very refreshing and perfect for a Sunday lunch when summer is winding down. I really enjoyed reading this post, Diane, and I loved the pictures. What an amazing experience your sister had in Senegal! 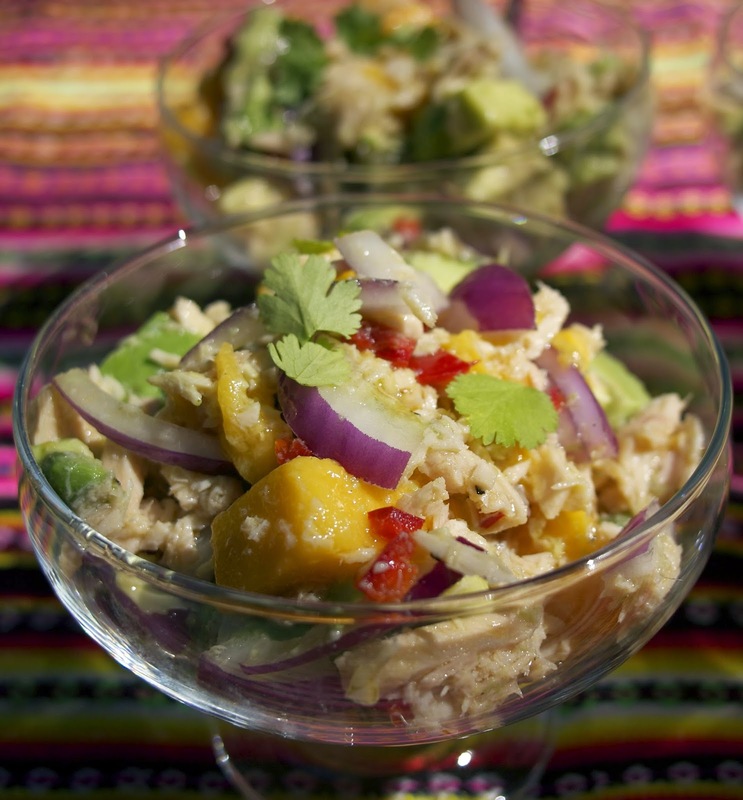 I also love the sound of this recipe - what a delicious twist on traditional tuna salad your West African Tuna Salad is! Thank you for sharing with us at the Hearth and Soul hop.